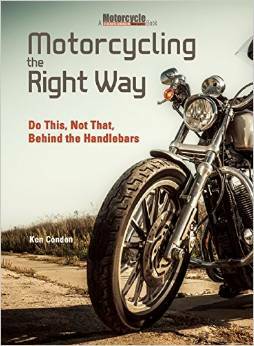 This article was originally published in Motorcyclist Magazine. Their names are infamous; Pordoi, Sella, Gavia, Gardena, and of course Stelvio. These are just a few of the mountain passes that snake up and over the mighty Italian Alps and jagged Dolomites. Riding these epic roads is not for the faint of heart or the weak of skill. Riding the steep hairpin switchbacks isn’t fundamentally different than riding any other twisty motorway, except these roads are turned all the way up to 11. 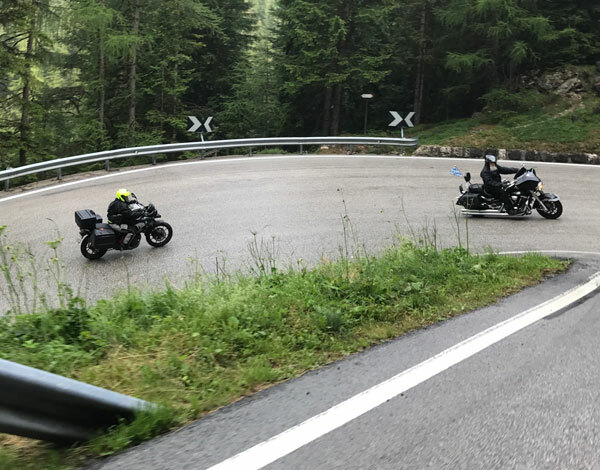 But with a little knowledge and pre-trip cornering practice you can tackle the wicked Alpine passes with enthusiasm, rather than dread. Maintain uphill momentum – On the way up the mountain gravity works in your favor to help slow for turns. But, slow down too much and the bike will want to fall over. Minimize instability by getting on the gas early, but not so early so you run wide. Control speed going downhill – When riding downhill gravity works against your attempts to scrub speed. This means you need to brake with greater force. To be safe, brake earlier so you can brake with less intensity. Use the rear brake – Apply the rear brake just before the front to minimize forward pitch and keep the wheels in alignment. Maintain light pressure on the rear binder for a moment after releasing the front brake to help “hook” the bike around turns. 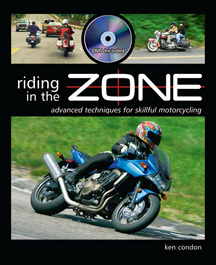 Drive out of each corner –Gradually accelerate as soon as the bike approaches mid corner to maintain speed and stabilize the chassis. Well-timed acceleration ensures a predictable path of travel. 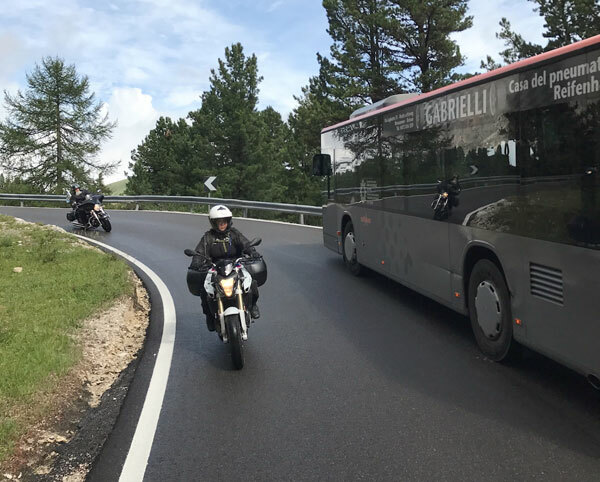 Use smooth brake-to-throttle transitions – Smoothly release the brake while simultaneously rolling on the throttle to avoid abruptness that can squander traction and cause your bike to exit wide. Watch for buses and bicycles – If you ride the Alps someday, you’ll be sharing the ridiculously narrow Alpine passes with tour buses and bicycle riders. Look well ahead and plan accordingly to avoid a collision. Expect to stop and wait until it’s safe to proceed. 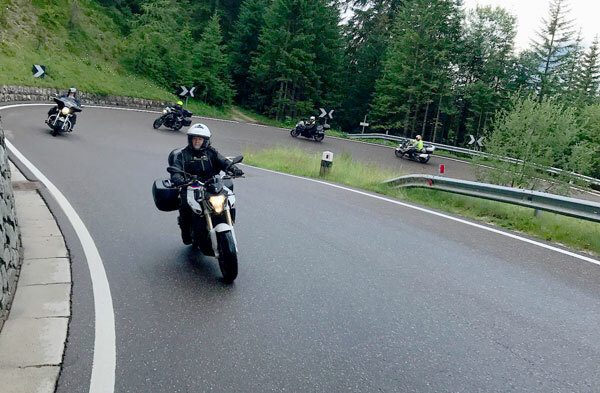 Do yourself a favor and bone up on your cornering skills before you hit the Alpine switchbacks. You’ll have a more enjoyable and safer experience. 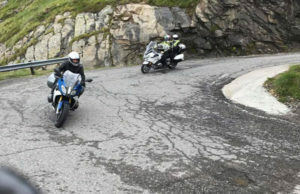 A ride down the Gardena Pass in the Dolomites in northern Italy.